Beauty: 4.5/5: Exceptional fynbos, especially proteas, with commanding mountain views. Difficulty rating: 7/10: The first day is quite demanding. On other days, the hut can be reached before lunchtime, but the route has a fair bit of uphill on the way. Not for the unfit or inexperienced. Technical rating: Standard walking trail. No scrambling is involved. 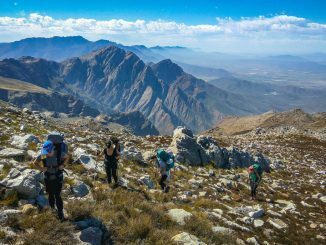 The Swellendam Hiking Trail, situated in the Marloth Nature Reserve, is one of the Western Cape’s most rewarding multi-day routes. 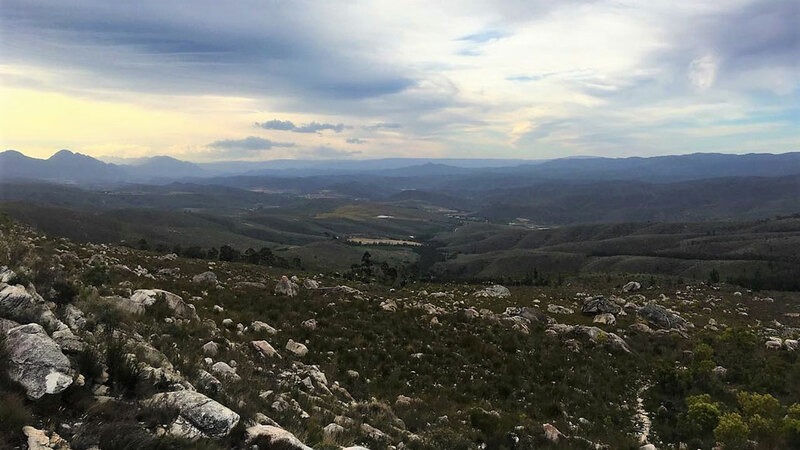 As it criss-crosses a large swathe of the Langeberge, it meanders through secluded green kloofs, vast fynbos-covered valleys and imposing mountainous terrain. I completed the hike in November 2017 and loved every second of it – it truly deserves a spot high up on your backpacking bucket list! Truly a fynbos paradise. The views aren’t too shabby, either! 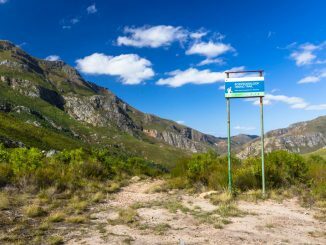 The Swellendam Hiking Trail is often compared to the Otter in terms of difficulty – hikers must have suitable experience. All food and cooking gear must be carried with. There’s plenty of clean water en route, and each hut is close to a perennial stream. Day 1’s hike is long, so aim to arrive at the office by 08:00. 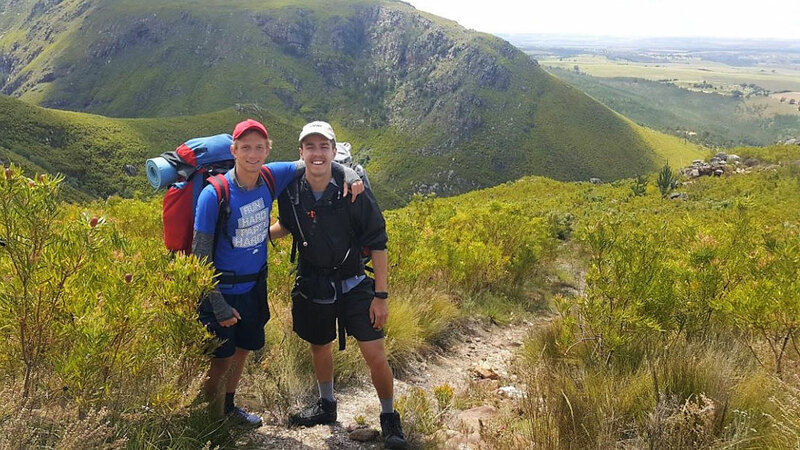 If you’re hiking in the heat of summer, consider accommodation in Swellendam to get an even earlier start. You can also enquire about the Glenstream Hut, situated at the reserve’s office. It’s possible to reach every hut by lunchtime (except for Day 1) if you start early enough – ideally 07:00. 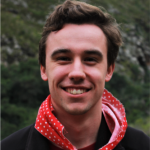 I found the distances on the CapeNature brochure’s map (link below) somewhat inaccurate – please refer to the descriptions below for more realistic distances. The trail itself is very well-marked, though. After signing in, we could park our cars behind a locked gate and caught a lift with the friendly park manager to the start at Duiwelsbos (you might have to hike in the 2km to the start). The trail jumps right into the action with a steep zig-zag climb through the fynbos – a long day awaits, so take it easy and conserve your energy. About halfway the trail swings North and heads over the mountain, with the majestic Boskloof gorge dropping down on the right-hand side. We crossed numerous small streams and used each opportunity to fill up. 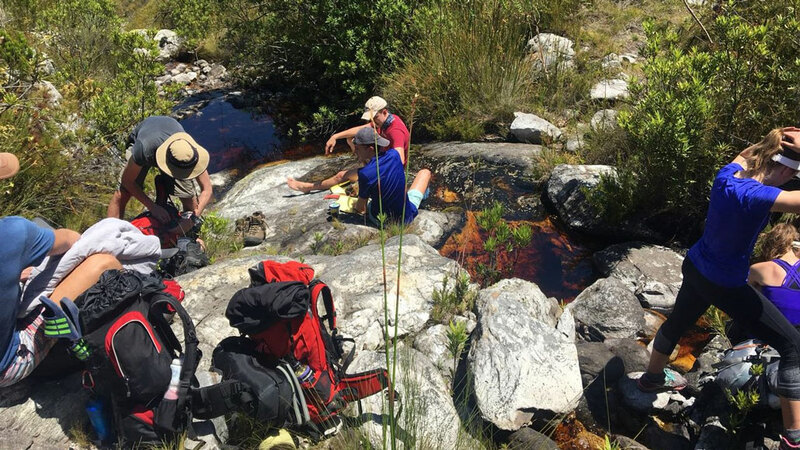 After a sting-in-the-tail final uphill it was wonderful to relax at Boskloof hut, taking a refreshing dip in the nearby rock pool and brewing up some boeretroos while basking in the peace and quiet. 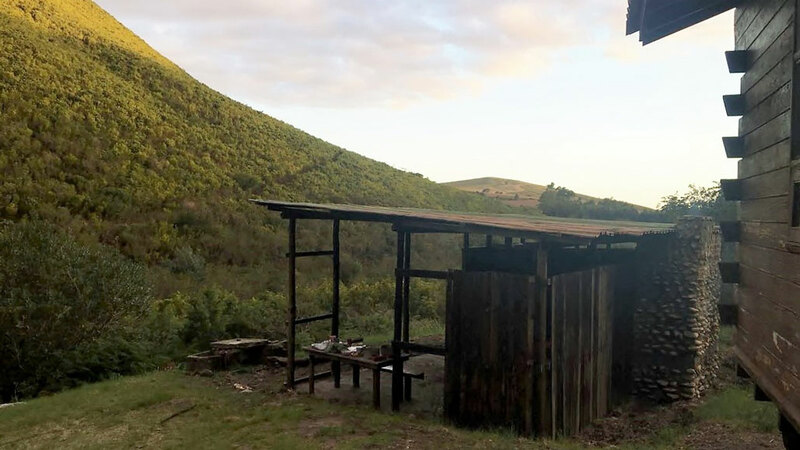 The original wooden Boskloof hut burned down some years ago, and has been replaced with a spartan sheet metal hut. You must take your own sleeping pad for this hut, or if you don’t mind sleeping on the floor for one night you can ditch the weight altogether. Day 1 is definitely the toughest and should not be underestimated; it will take you the better part of the day to reach Boskloof. From this point it only gets easier, though – with this prospect in mind, we tucked in for an early night to rise with the sun the next day. What a glorious sight as the first light woke us up! As will soon become daily tradition, the trail starts with an uphill to get the blood flowing. It then crosses into a wide valley, where it follows the Langkuile river upstream. This part of the route is fairly flat – as we had started just after 07:00 and were making good progress, we decided to push forward to reach the next hut by lunchtime. Soon we reached the Goedgeloofnek that looks down the other side of the mountains to the Robertson Valley. Only (steep) downhill from here! Far below, the Goedgeloof hut complex was visible, but we still had to carefully descend the rocky slope before we could shrug off our packs. You can count on just more than an hour’s descent to the hut from the Nek. Compared to Boskloof, Goedgeloof is luxurious. 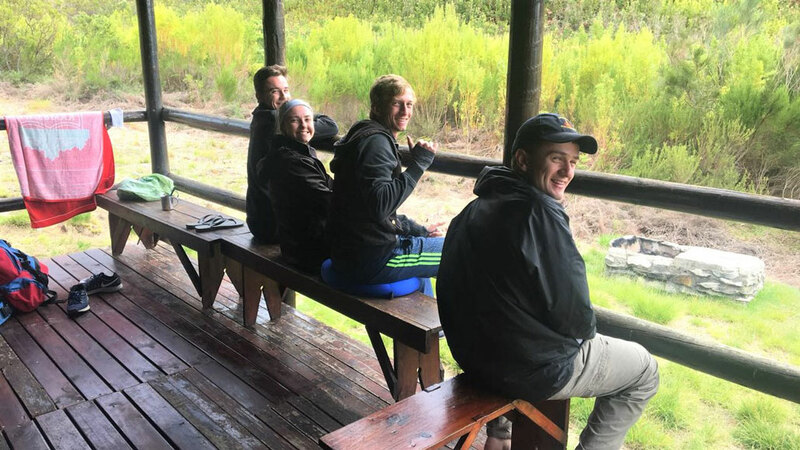 There are two dormitory buildings with bunk beds and mattresses, eco toilets, a cool stream nearby, and a great communal kitchen with a picnic table and stoep to admire the sunset over the rolling hills. Please note that the dam close to the hut is on private property and swimming is prohibited. This ended up being one of the easiest days, although we awoke to rain drumming on the roof. Luckily, by the time we’d all croaked our good mornings to each other and chugged a Hug-in-a-Mug, the clouds had cleared. By now we were used to the customary climb at the beginning, and Day 3 is no exception! The path ambles along before a stiff climb up to Warmwaternek around the 3km mark, with an elevation gain of 500m. Take it slowly and steadily – after this initial climb, the rest of the day is a breeze. We took a well-deserved break on Warmwaternek, snapping some group photos and sunning ourselves on the rocks. From here the trail winds along the Protea Valley to its namesake hut. 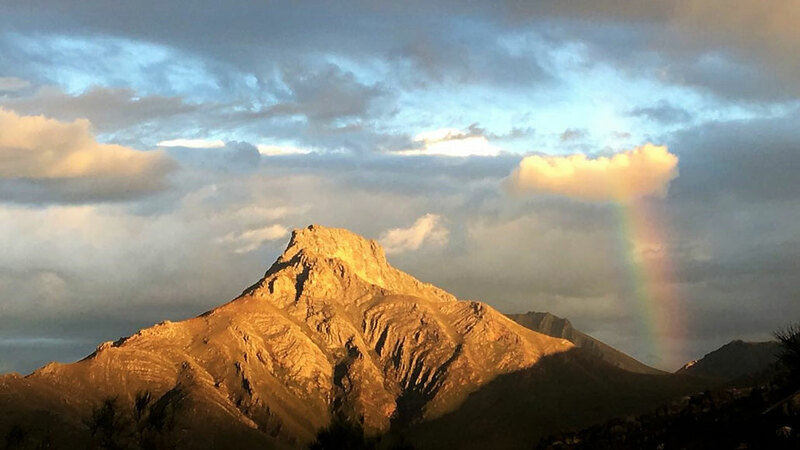 En route, the so-called “Clock Peaks” and the imposing 1710m Misty Point (often true to its name) stand guard over a breath-taking landscape that teems with…you guessed it, proteas! The hut is a wooden beauty with a large covered stoep, two dormitories with bunk beds and mattresses, and long drop outhouses some distance away. We also had the privilege of seeing a full double rainbow over Misty Point – this place never fails to disappoint! Today the trail, aptly named the “Kruispad”, crosses over again to the Swellendam side of the mountain. 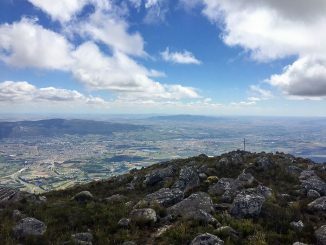 Note that a longer detour via the Vensterbank lookout point is currently closed due to fynbos rehabilitation. 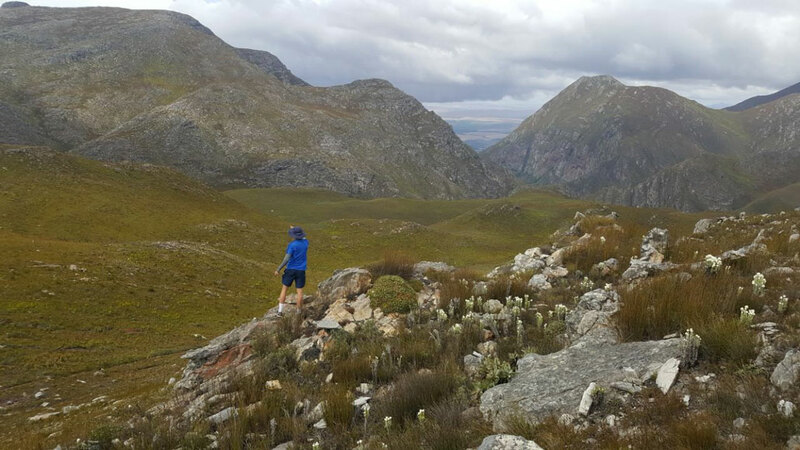 After the usual uphill (gains 200m) and a quick stop to admire the view over the farmland and faraway Indian Ocean, we descended into Kleinhoutboskloof, where the path precariously hugs the mountainside as it descends. It’s not too technical, but take care with the loose terrain! The bottom part of the trail is an easy cruise down to the Wolfkloof gorge – look out for King Proteas on the way! Nestled down by the river is the final wooden hut, with a separate basic lapa and fireplace. We spared little time grabbing our towels to head down to the river close by, which has several large pools to explore. The hut’s grass lawn also lends itself perfectly to afternoon naps, sipping tea, spotting satellites and sleeping in the proverbial 5-billion-star hotel if you wish. Amenity-wise, there are bunk beds and mattresses, a basic long drop outhouse and a cold-water shower, which was dysfunctional when we were there. Nothing beats a refreshing dip in the river, anyways! Our last day was filled with excitement to cross the finish line (we couldn’t wait to order a meneer of a burger in town), but also a sense of missing the solitude and raw beauty of the mountains already. 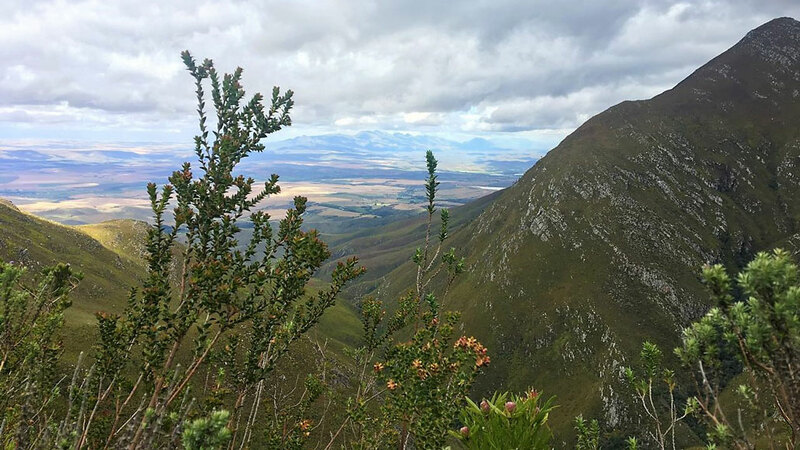 Don’t be fooled by the prospect of “this is over already” – the Swellendam Hiking Trail won’t give up without a fight! A rather sneaky climb heads up and out of Wolfkloof to the next gorge, Hermitagekloof. There’s a small ravine here with a rock pool and lovely shade for a quick brunch. All in all, it was a challenging, but amazing experience that left me longing for the next backpacking trip as soon as I got home. Stoep chats – check. Cup of tea – check. Happy hikers – check! • Start as early as possible. We got up at 05:30 (with sunrise) to set off at 07:00. Plan accordingly for less daylight hours in winter. • Day 1 is quite tough. Pace yourself, pack high-calorie snacks, and fill up at every stream. • It works best if one person handles navigation and leading the hike, and someone else manages the meal plan and cooking gear. Assign roles to the rest of your party – take turns to wash pots, help with cooking, fetch water etc. • Make electrolyte drinks such as Game or Rehidrat. • The weather can be unpredictable and cold all year round – a waterproof outer layer is essential. • Someone should carry a complete first aid kit, preferably with first aid knowledge. • There are evacuation points at Goedgeloof and Wolfkloof if someone is seriously injured. All bookings are made through CapeNature’s central booking line. Book a few months ahead in the popular warmer months. What an absolutely fantastic write-up! I had never heard of this hike before, thank you so much. Who is the celebrity?! Hi Melvin, please see the “Bookings & Enquiries” section in the article. Hi Dania! Only getting to your comment now… it’s a pleasure, I had as much fun reviewing the trail as I did hiking it! Good description of a beautiful trail. We did it in March. Perhaps you meant the Montagu Valley or the Klein Karoo. It is not the Robertson Valley. Thanks Thomas! You’re right – well spotted. We’ll edit it ASAP. This article brings back memories, mostly good. Have done this hike more than once.Done the full route to Wolfkloof, a fairly long trip around far end of the mountain.What is it with Cape Nature, WC, that they can’t get all their huts up to std. Why must one hut not have bunks? I now live in Swellendam and the mountains are the most exciting thing about the area. Otherwise it is a desert, intellectually. Has anyone cut the hike down to 3 days vs 5?